The market is flooded with a wide range of wireless speakers, but the JBL has always remained near the top. Th JBL Charge 3 is one of the very few wireless speakers out there that lets you charge your device while enjoying your tracks. It falls in the same waterproof category as its competitors in the UE Boom series of speakers. You can use it near the pool or along the beach without fearing for their safety. Lets take a closer look at what has been improved with our JBL Charge 3 Waterproof Speaker Review. Many JBL Charge 3 fans love it for its astonishing sound quality, build and design and speaker battery life. And just like most of their products, the JBL Charge 3 is surprisingly affordable. The Charge 3 shares most of the design features with its predecessors including the full waterproof capability. This means it can not only survive water splash, but you can completely submerge it in water, and it will still hit like never before. In the box, you get the Charge 3, a micro USB cable, a charging block, warranty information and instruction booklet. The speaker comes with a 6000mAh battery with promises and impressive 20 hours of playback music. As long as you have the relevant USB cable at hand, you can connect your device to the USB socket on the back of the Charge 3 speaker and piggyback the built-in battery. The cylindrical shape of the JBL Charge 3 speaker is similar to most of the speaker models that JBL churns out. On top, you will find the standard set of buttons that JBL puts on all their speakers. They’re made of a soft plastic and are slightly raised above the speaker. The only buttons that aren’t raised are the power and JBL Connect buttons which are flush with the speaker. The change from the previous aluminum grill to a new durable fabric that covers the speaker is not only waterproof but also gives it a good grip. The JBL logo sits nicely on the front face while the bottom features a small stand built into the design of the speaker. There are five tiny indicator lights on it that shows you how much battery charge you have left. On the back, you find a rubber flap that hides the USB output, the 3.5mm input, and micro USB input. Although many manufacture have high waterproof ratings, I would still treat any equipment with care with the added assurance that if I drop it in the water or leave it in the rain I don't have to worry. The JBL Charge 3 comes with dual external passive radiators that offer a visual element to your music playing. If you throw in a bass-heavy track, you can actually see the radiators vibrate. The Charge 3 is also designed with portability in mind and fits nicely into the company’s existing speaker range. Thanks to its rugged design, the Charge 3 travels extremely well. Apart from looking sturdy and robust, it feels just hardy and tough enough in hand. So if you’re planning for an active beach holiday or camping weekend, the Charge 3 can handle that with no worries. If the built quality is great, the connection is amazing on this speaker. Without walls, you can expect a strong connection of up to 50 or 60 feet. Once you throw a wall or two in between, the range drops down to 30 feet, but still very strong. You can play/pause music, skip to next song and control volume by simply double-tapping the play button. Expect a fully charged battery to last more or less 20 hours. But note that charging your other devices on it will shave a few hours off. There is also a built-in mic which works with the speaker’s noise and echo-canceling technology for hands-free calling. You also have an option to pair it up with other compatible JBL speakers for a supersize sound experience. The rugged and sturdy build may confuse you into thinking the Charge 3 is a shy wireless speaker. However, on turning it up, you will be hit by a powerful, enthusiastic sound by the passive radiators pulsing vigorously at either end of the speaker. 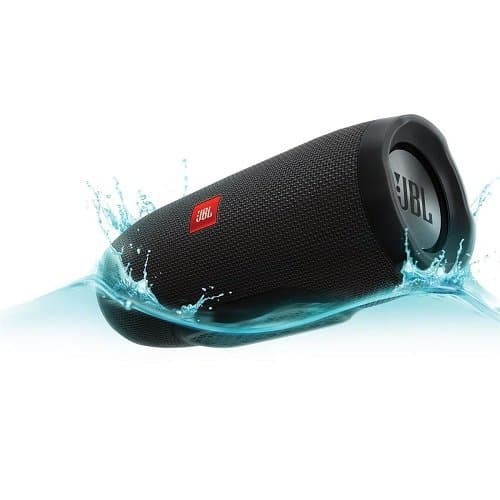 The JBL sounds more substantial and gives more weight to vocals and bass kicks. The lows sound solid and extremely powerful while the bass line extends down with the speaker showing a commendable level of control. At insanely loud volume level, the Charge 3 keeps it’s cool and doesn’t distort the sound quality. It might not be powerful enough to make you start searching for a sub woofer in the room, but the bass response offered by the two drivers and two passive radiators is more than what you can expect from a speaker of this size and price. If you need a little more volume but with less portability the bigger size The new JBL ﻿﻿Xtreme 2 ﻿﻿﻿ is a real party machine for just a few dollars more than the JBL Charge. Especially if you keep an eye out for them to go on sale. Listening to any track with less deep bass reveals vocals with a healthy level of low-mids and high-mids that add richness and makes things a little clear and defined. The drums and bass guitars have a nice low-end that is not dramatically boosted like some of the subwoofer-based speakers. The sound here is generally rich and solid through the low-mids, and clear and defined through the high-mids and highs, which allows the vocals and guitar strumming to have plenty of definition. On orchestra tracks, the strings and vocals receive more attention and the lower instrumentals get some added richness that never sounds unnaturally boosted. As already mentioned, the JBL Charge 3 is a sizable speaker that equally translates into a big sound. There is no doubt it can effortlessly fill a large room and project sound fairly far when used outside. Considering how loud it can get, I tend to think it was made to be used at the poolside. The JBL Charge 3 is an excellent Bluetooth speaker. The design is great, the sound quality is amazing and the premium features are a welcome plus. I particularly love the waterproofing capability that allows users to take the Charge 3 with them literally anywhere. The JBL Charge 3 is a perfect choice for anyone who needs a perfect balance between an exceptionally portable design and a modest price without compromising sound quality. If you're looking for something with a little more power then the JBL Charge 3 the newly released JBL Boom Box is now available. A retail price of $449 US. The price is quite a bit more than the JBL Charge 3 but if you want a party speaker with a-lot of volume and incredible sound then you won't be disappointed. This newly designed speaker packs a real punch. I am presently working on a hands-on review and so far my findings are very positive. Fully water proof. Throw it in the water and it will float. It has two sound setting one for outdoor and another for indoor. Normally sound from a speaker in an outdoor or large room setting losses a lot of high-end frequencies. This is why JBL has an outdoor setting that boosts the high end for a better outdoor sound. I do a Boot Camp exercise class in a large room down at my local gym. I took the JBL Boombox to try out. There was no lack of volume. This unit can be played at top volume without distortion. In the large room I first turned it on in indoor mode and it sounded ok I then switch to the outdoor mode and the sound in the large room had much clearer sound. You will find the outdoor setting too harsh sounding indoors. Setting it to the indoor mode reduces the high end but it still is a very crisp sounding speaker. The JBL Boom Box has 24 hrs of play time. After preforming a number of tests. At top volume, it will last a more like 12 hrs and with 50% volume you will get closer to 21hrs. Charge time is about 4hrs. I listened to a number of styles of music to get a full idea of the Boombox's sound capabilities. I tried an old classic Peter Gabriel " Don't Give Up" and it sounds incredible the bass was snappy and overall sound was impressive. Some older recordings I found a little harsh sounding but if you turned down the volume the sound was more pleasant. Modern pop songs really shine with the JBL Boombox a real party machine. Easily pair it with many other Bluetooth speakers. You can pair two Boombox speakers together for a full stereo sound. Your outdoor beach party will be off the hook. The JBL Boombox speaker is pricey coming in at a retail price of $449.95 but you really are getting a bulletproof versatile speaker. It has incredible sound for a portable Bluetooth speaker and with 24 hours play time to keep the party going all day. The sound quality may not be for everyone if you don't like a crisp sound it may have a little too much high end. But don't be disappointed bass freaks will love it. If you listen to a lot of older classics than listening at moderate volume will sound the best. An App with a little EQ to adjust the sound would be a nice addition. Modern pop music really performs well on the Boombox. If that's what you like to listen to you will love it. You can crank that volume and piss off your neighbours really easy with the JBL Boombox. The bass travels right through the walls. The JBL Boombox speaker out performance most speakers in this class, but costs a few dollars more. Keep an eye out for sales I have seen it down to $400 and I imagine there will be more sales in the future.